HONG KONG – President Donald Trump is finding little support among his Asian allies – both publicly and behind the scenes – as he weighs a military attack on North Korea after unilaterally firing missiles on Syria. Any attack on Kim Jong Un’s regime – even a limited strike on weapons facilities – risks catastrophic blowback on some of Asia’s biggest economies. It could threaten to trigger a U.S. war with China and leave the capitals of allies South Korea and Japan at risk of destruction, the same calculation that has helped maintain an uneasy peace in North Asia since the Korean War in the 1950s. Trump has sent warships near North Korea and threatened to act alone if necessary to prevent it from gaining the capability to strike the U.S. with a nuclear weapon. The unease has wiped $30 billion from South Korean equity values this week and driven a spike in the nation’s debt risk, as Kim shows signs of conducting another nuclear or ballistic-missile test. South Korea doesn’t support a preemptive strike and is closely coordinating with the Trump administration, according to an Asian government official familiar with North Korean issues who asked not to be identified. Trump must take into consideration the countries affected for any military decision, the official said. Yoshihide Suga, the top spokesman for Japanese Prime Minister Shinzo Abe’s government, declined to comment Wednesday on whether the country would support a U.S. strike on North Korea. Japan might only support a limited strike that targeted North Korea’s weapon facilities, according to a person with knowledge of the Abe administration’s thinking. In that scenario, the biggest risk Japan sees would be a North Korean attack on U.S. bases in the country, said the person, who asked not to be named while discussing matters of national security. Trump has focused his attention on pressuring China, North Korea’s main military ally and benefactor. He spoke by phone with President Xi Jinping on Wednesday morning in Beijing, shortly after saying that China could get a better trade deal with the U.S. if it reined in a regime it has supported since the Korean War, in part to prevent having an American ally on its doorstep. Still, China signaled to North Korea that it was running out of patience. The Global Times, a nationalist newspaper affiliated with the Communist Party, warned that a nuclear test now would represent a “slap in the face” to the U.S. government and could prompt China to restrict oil sales to North Korea. “Pyongyang should avoid making mistakes at this time,” the paper said. 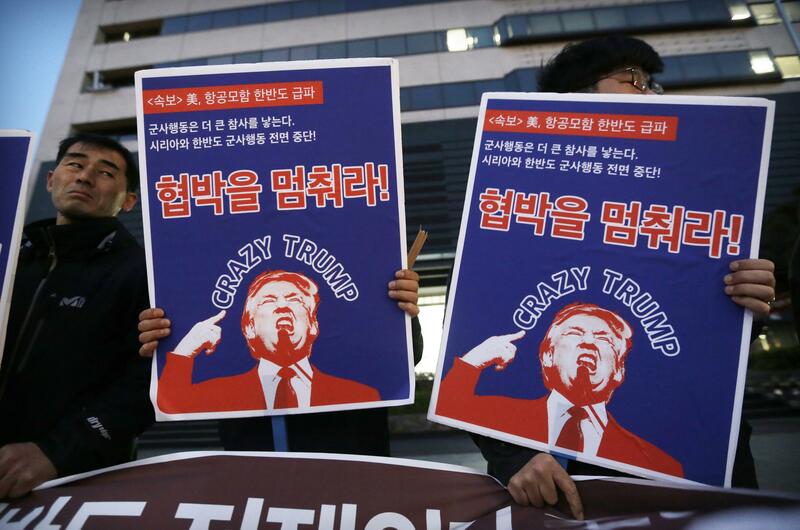 The article marks a change in tone from the withering criticism unleashed after the U.S. began deploying the Terminal High Altitude Area Defense, or Thaad, anti-missile shield in South Korea in March. North Korea’s most recent ballistic missile test was on April 5, the eve of the first meeting between Xi and Trump in Florida. The most immediate reaction by North Korea to a strike would likely be massive artillery fire on Seoul and its surroundings, which is home to just more than half of South Korea’s 51 million people, according to a report published by Stratfor last year. North Korean artillery installations along the border can be activated faster than air or naval assets and larger ballistic missiles that can target South Korean, Japanese or American bases in the region with nuclear, chemical and biological weapons. While residents of Seoul are used to threats from North Korea, the issue has dominated the campaign for a presidential election on May 9. The front-runners, Moon Jae-in and Ahn Cheol-soo, have indicated they would seek talks with North Korea, and the caretaker government would be unlikely to approve a strike before then. Even conservative lawmakers in South Korea don’t see an attack anytime soon. Kim Young-woo, a lawmaker with the Bareun Party and chairman of the National Assembly’s National Defense Committee, said if anything the U.S. might take action if North Korea threatened allies with an intercontinental ballistic missile – a prospect raised by former Pentagon chief Ash Carter in January. Published: April 13, 2017, 5:40 a.m.